How many estimates should I get for my remodeling project? If a contractor comes to you highly recommended by a trusted friend or family member and you have met with the contractor and feel comfortable with them, then getting additional estimates is probably not necessary. However, many clients new to the process invite 2-3 companies for an onsite consultation at their home. On site, both contractors ought to be able to give a ballpark estimate. Ideally, at that point, the client the contractor with whom they foresee the best relationship and whose ballpark estimate felt most realistic. It’s important to note that we often find when a client interviews multiple contractors, they may casually mention a brick laid patio to one contractor while another contractor – having not received any information – uses instead flagstone and the labor required to lay flagstone for their job costing. Suddenly the two estimates look vastly different based on differing kinds and quality of materials used to estimate costs. In other words, while both contractors may be quoting the same verbal scope of work – you are often still left comparing apples to oranges. While we give a preliminary estimate at no charge to our prospective clients, we enter into a fee-based Pre Construction Agreement to officially bid the project. This allows us to refine the scope, assist in making all selections, meet tradesmen at your house for quotes and produce a written Bid Proposal complete with exactly what we plan to do at your house, how and with what materials. Why do we first engage in a Pre Construction/Design Agreement before receiving an official bid? There are many reasons we have found these agreements to be vital in beginning a remodel in the best possible manner with the best possible experience. After 25 years of remodeling, it’s obvious that the most successful projects are those carefully and thoroughly planned. The Pre Construction/Design Agreement indicates a commitment on your part, which in turn opens the door for us to also commit to the detailed planning of your remodel. Under an agreement, we are able to invest extensive time in designing, developing and estimating. We collaborate with you on the design until we arrive at a price that you are most comfortable with. We work with you to solidify all of your selections. We contact city planning to ensure approval of your proposed remodel. We meet subcontractors at your house to evaluate existing conditions. In the end, with every detail attended to, we not only can hand you a comprehensive Proposal report with a fixed price bid, but if approved by you for construction, we can hand our Production team a complete and in-depth plan of action. In the end, it’s a win-win. You get our full attention and analysis. And by the time the hammers start swinging, we have all considerations ironed out. Should I plan for more money than the contract price? We recommend reserving an additional 5-10 percent to cover the costs of overages on allowances (like choosing a more expensive marble for your countertop than anticipated) and unforeseen issues (like discovering wood rot or termite damage) once construction is underway. How should I go about getting started? To gain a better “big picture” perspective, you should visit our Process page. That said, whether you’ve architectural plans in hand or nothing more than a Pinterest picture locked in your mind, we can step in and begin working with you at any point. Do I always have to have plans for my project? The answer to this question is easy…yes and no! Every project needs a plan. However, we are happy to develop those plans on your behalf. Depending on the nature of your project (a new home vs. an addition vs. a bathroom remodel) we may engage an architect at some point. If you are keeping within the existing footprint of your bedroom, kitchen, etc. we will develop plans with our in-house designer under the purview of a Pre Construction Design Agreement. How much will my project cost per square foot? No two kitchens are alike, no two bathrooms are alike, no two room additions are alike and the existing conditions of the house being worked on are never alike – thus a cost per square foot just can’t be used in remodeling, like it can in new construction. What if my remodeling idea won’t work or is cost prohibitive? More often than not, it will work! Virtually anything in remodeling can be accomplished…but, how much it will cost to achieve it is the better question! In remodeling it is very easy to reach a point of “diminishing return” whereby the cost of the activity significantly outweighs the benefit. 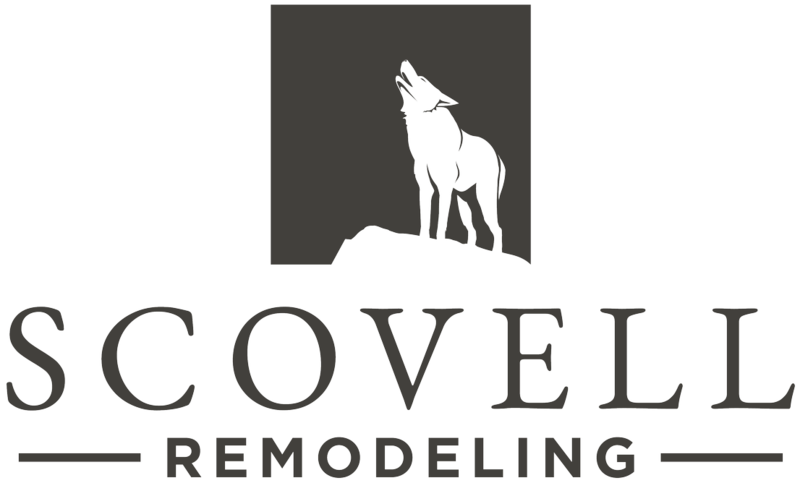 It’s in this respect that Scovell Remodeling has a very unique and important insight. In addition to being a certified remodeler, our owner and president Jim Scovell is – and has been for nearly 30 years – a licensed real estate agent in Missouri and Kansas. In addition to providing you with answers about what can and can’t be done in a remodeling project, Jim can shed light on what ought to be done given the neighborhood and current market values. After 25 years in the industry, we know that when we speak the words “two to three months,” all the client hears is “two months!” So while we dread this question given the dozens of variables that make answering it so difficult (weather, backorders, unforeseen issues discovered behind walls), we know that it’s one of the most desired answers! So we’ve done our best to throw together some estimates. But take these time frames for what they are…ESTIMATES! Kitchen remodels – An average kitchen remodel where the size remains generally the same will take between three and four months. If your kitchen remodel includes expanding the existing footprint of your home it will take longer. Bath remodels – An average-sized hall bath cosmetic remodel can take as little time as 5-6 weeks. However, if you are contemplating remodeling and moving the location of the fixtures in a hall bath, it will increase the duration of the project. As will remodeling the master bathroom and grabbing a closet or part of another room to increase its size. Room additions – Obviously, how long the project will take to complete depends on the type and size of the addition and its final use. For instance, an addition that adds an extra bedroom and closet will take less time than an addition that expands your kitchen. Generally, a bedroom or family room addition will take around three to four months to complete. Basement finishes – Depending on the level of finish desired and size of your basement, times for the project can vary quite a bit. For a minor finish of a basement, you may be looking at 4-6 weeks to complete. On the other hand, if you want to include a bedroom with a bath and a family room with a small kitchenette it could take 10-12 weeks. One of our proudest basement projects in recent years took much longer…it also included features that earned it the Best Basement Remodel of the Year by REMY! Can I live at home during my remodel? In most cases the answer is yes. If you are remodeling a kitchen we can even help you set up a temporary kitchen in another room. Of course, if you are planning on a whole house remodel, you will need to find someplace else to live.